If you go to a farmer's market or store that caters to many different cultures, you might feel overwhelmed at all the strange produce you find. What is a dragonfruit, a kumquat or a jicama? What is swede? If you only use a few staple fruits and vegetables, then cooking unfamiliar vegetables can seem especially confusing. However, discovering a little bit about new foods can give you a taste of flavors that you will want to add to your regular diet. You can also discover low calorie and high nutrient substitutes for foods you're trying to cut back on. Where Does Swede Come From? What Are Some Good Swede Recipes? Swede is the British name for a root vegetable that is typically called a rutabaga in the United States. The name swede is the most common name for this vegetable in the UK, Scotland, Ireland, Australia and New Zealand. It is also called a neep or Swedish turnip; the shortening of this term is where "swede" came from. 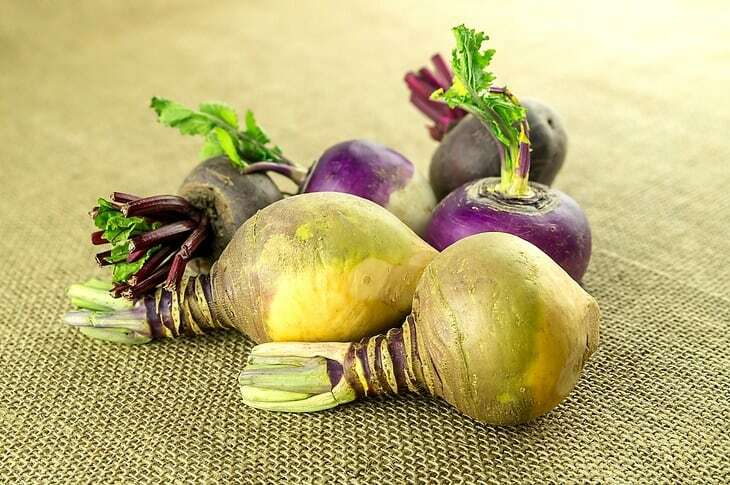 The swede is a hybrid vegetable that comes from cross-breeding a cabbage and a turnip. 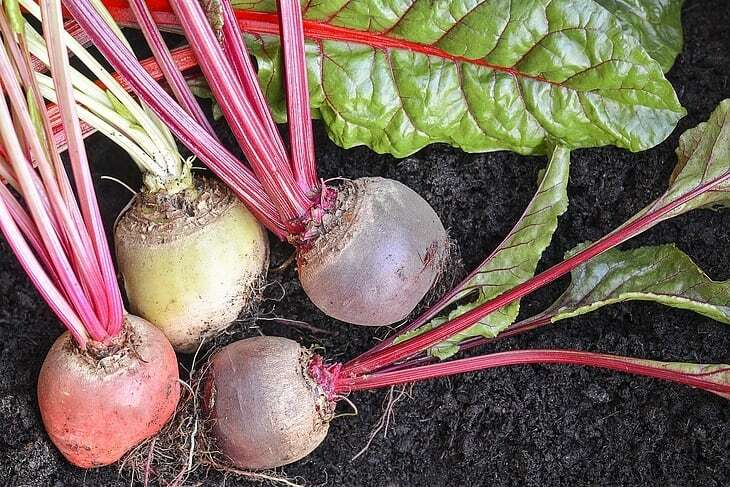 This creates a vegetable that is more cold hardy than a traditional turnip, but it offers edible greens and a tasty root vegetable that stores well. Both parts of the vegetable can be eaten by people and livestock. The name Swedish turnip is believed to originate in either Scandinavia or Russia, and it was found growing wild in Sweden in the early 1600s. Over the next two centuries, it was spread throughout northern Europe as a hearty root and livestock vegetable. Midwestern U.S. farmers were growing the crop by the early 1800s. Swede is a versatile vegetable. You can eat the greens in as many ways as you eat kale, and you can eat the root in as many ways as you can eat a potato. The greens: The greens are good raw, but they have a bite. Can be softened by blanching and adding a salt and citrus rub or marinade. Can be cooked, boiled, stir-fried, added to stews, juiced and blended into smoothies. The root: The flavor of the root is a little more peppery than potatoes, but many people find them to taste surprisingly flavorful. Can be roasted, boiled, mashed, fried, julienned, pureed. Used as a thickener, added to stews or shredded like hash browns. Swede is higher in fiber and lower on the glycemic index than potatoes although still on the higher side as all root vegetables serve as sugar stores. It is high in vitamin C, zinc and potassium. It serves as a good source of cancer-fighting antioxidants. The fiber in the vegetable may be used to combat gas and diarrhea. The versatility of this vegetable makes it easy to use a substitute in many of your favorite foods or as a slight variation to classic meals. Try Gordon Ramsay's ﻿﻿﻿﻿swede an﻿d carda﻿mom soup﻿﻿﻿﻿ or swede, leek and potato gratin. 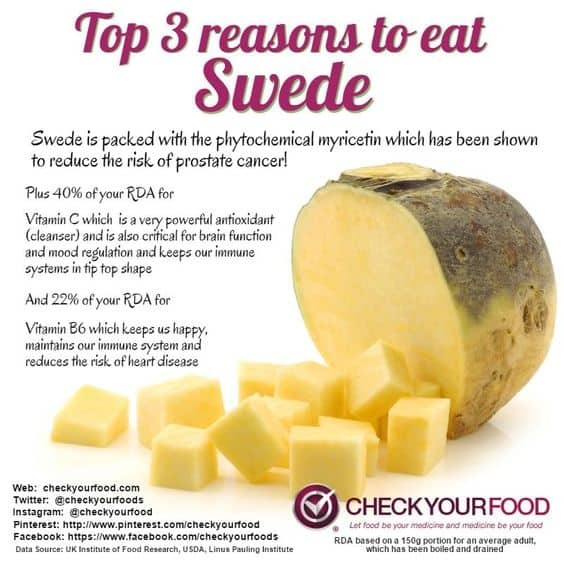 Moreover, we still have 3 amazing recipes of swede for you to apply to your daily diet. Here is a look at more fun ways to eat swede. 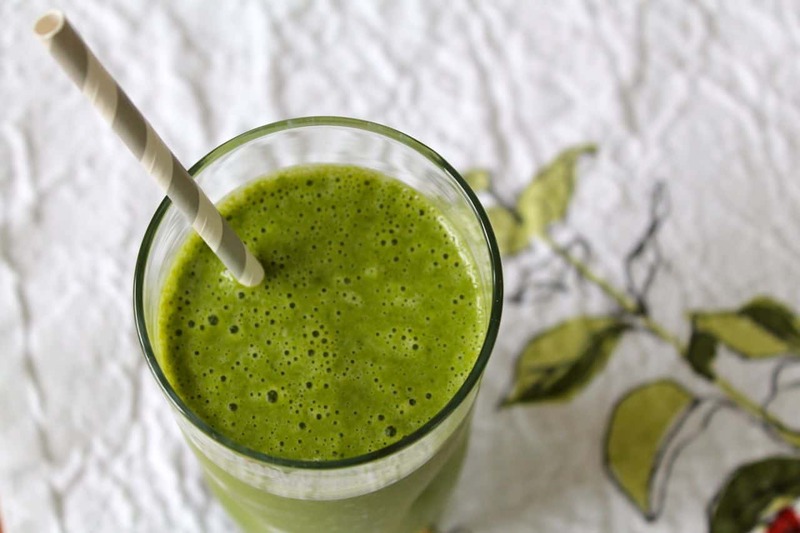 Swede greens can be used as an ingredient in your favorite green smoothie recipe. However, swede greens are not as mild tasting as kale or spinach, so use them sparingly. If you have a good smoothie recipe that uses cabbage and ginger, this is an excellent place to add swede greens. This alternative to corned beef and cabbage is a fun change to the typical recipe. It is easy to prepare before you leave for work and school, letting you come home to a mouthwatering dinner. This is a no-liquid recipe. The liquid that comes out of the meat and vegetables naturally serves to cook them well without over-softening them or boiling the meat. The bottom of the slow cooker should be a chopped onion. Above that, place the swede root. Place the corned beef brisket on top of this. Layer the swede greens and cabbage on top of the corned beef. Close the lid, and cook on low for 8 to 10 hours. The flavors imparted by roasting then pureeing the swede are much more complex than the boiled version of mash. It is an excellent bed on which to serve your favorite protein. 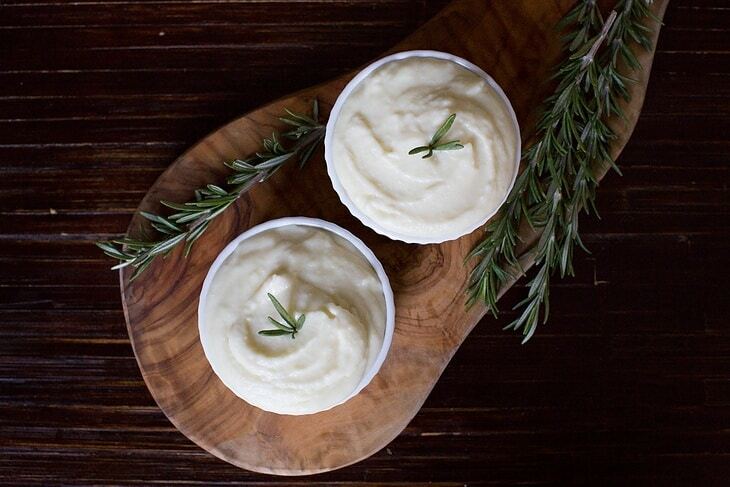 Pork chops, fish, beef and chicken breasts are all excellent pairings with this mash. 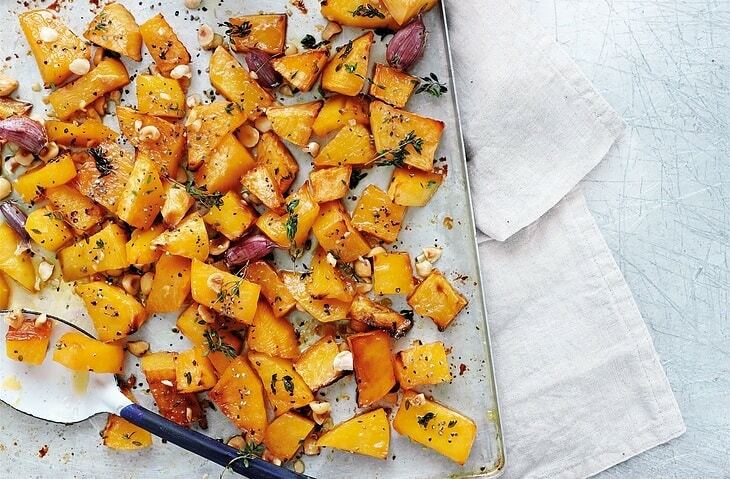 Toss the cubed swede roots in the olive oil, rosemary, salt and pepper and place them on a cookie sheet in a single layer. 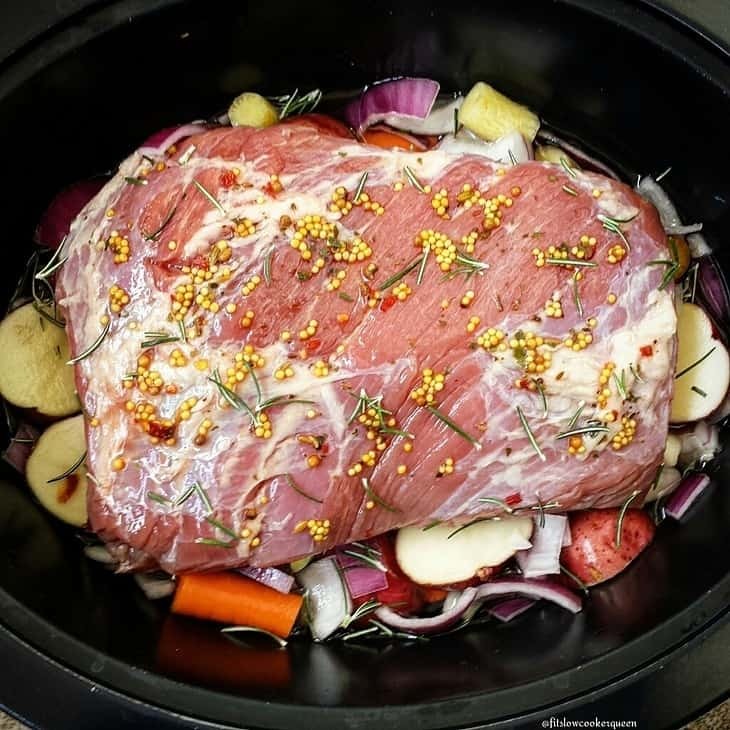 Roast for 20 minutes, then flip, cooking another 10 to 15 minutes until both sides are golden. Transfer the cooked cubes, still warm, to a blender and add 2 tablespoons of cream. Blend and add more cream, tablespoon by tablespoon, until you reach the consistency you want. Add a little more salt and pepper to taste and spread on your plate as the base for your meal. 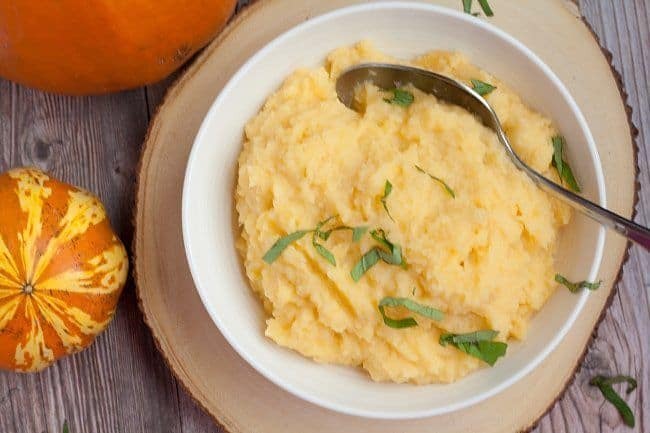 As you add swede to your menu, you might find that the peppery flavor is a little off-putting to your family members who are more used to the blander potato. If you really want to make swede a regular part of your family's menu, then it takes repeat attempts. It takes around 7 tastings for a flavor to become normal and for your body to begin to crave it. Keep asking your family to take a taste, and after a while, it will become the norm, and you will be enjoying swede victory on a plate. Do you have a favorite swede recipe or a question about swede? Leave it in the comments below!